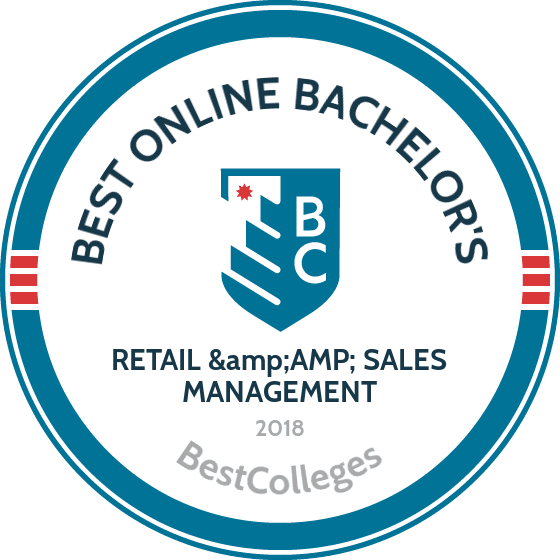 WHAT ARE THE BEST ONLINE BACHELOR'S DEGREES IN RETAIL & SALES MANAGEMENT? What Will I Learn in an Online Bachelor's in Retail and Sales Management? Graduates with an online retail management degree are prepared to buy, develop, and sell products that meet the demands of the average 21st century customer. Today's globalized economy means that retail professionals must have the knowledge necessary to succeed in the domestic and global marketplaces. Retail management bachelor's degree program teach students the technical, problem-solving, and leadership skills required to serve consumers who rely on your goods and services. The U.S. Bureau of Labor Statistics projects that employment in retail trade will grow about 7% by the year 2022, which means adding more than 1 million positions. The field is booming thanks to the emergence of online retail in recent years. Oregon State’s Ecampus provides access to rigorous programs that are delivered asynchronously for flexibility. The 180-credit, AACSB-accredited BA/BS in business administration includes core courses in financial accounting, business law, business information systems, marketing, and operations management. Students have the option to specialize in one of four areas, each requiring between 24-28 credits. This includes digital marketing, retail management, supply chain and logistics management, and general business. Students also have the option of adding a minor such as history or fisheries and wildlife. The online retail management degree accepts transfer credits from other accredited institutions, but a minimum of 45 of the last 75 credits must be completed through Oregon State. Admission requires a high school diploma or equivalent. All distance learners at Oregon State pay the same tuition regardless of in-state or out-of-state residency. Students must maintain a minimum 2.5 GPA to graduate. UA Online attracts students from around the world because of its rigorous degrees, diverse student body, and flexibility. The BS in retailing and consumer sciences is available to learners seeking careers in business or career advancement. Coursework includes accounting, economics, retailing, statistics, consumer behavior, and retail promotion. There is also an option to concentrate in retail technology. Students are encouraged to engage in two structured internships, each lasting 10-12 weeks. Students accepted into the program become pre-majors until they successfully complete lower division courses. Courses in the online retail management degree are delivered asynchronously using the D2L learning management system, and students have access to success coaches to help them accomplish their academic goals. Distance learners pay the same tuition regardless of residency. A number of merit and needs-based scholarships are available through the College of Agriculture and Life Sciences and the Lundgren Center for Retailing. ASU’s W.P. Carey School of Business offers a BA in business in retail management. The program is applicable to students seeking leadership careers in retail. Through ASU Online, distance learners can earn the 120-credit online retail management degree, which is comprised of 41 classes, each lasting seven-and-a-half weeks. The curriculum includes business courses in economics, accounting, and business statistics. The retail concentration includes coursework in food retailing, finance, global supply chain, business and sustainability, and quality management and measurement. Support services include online tutoring, success coaches, tech support, and career services. Admission to the online retail management degree at the AACSB-accredited business school requires a high school diploma, acceptable SAT or ACT scores, or a minimum 3.0 GPA in competency courses at the high school level. Transfer students are accepted but must have a minimum 3.0 GPA. Distance learners make up the majority of SNHU's enrollment. The BS in fashion merchandising management is a 120-credit program that develops skilled managers versed in the intricacies of marketing and selling fashion. Students learn fashion marketing, consumer behavior and retail operations, color and textile theory, and planning and management while developing an understanding of business strategy. Classes in the retail management bachelor’s degree program are taught by experts in the fashion industry and are kept small to facilitate one-on-one interaction. Graduates are proficient in developing planning strategies, applying management techniques, collecting and effectively using data through qualitative and quantitative tools, and interpreting the data to predict trends and the bottom line. SNHU has a generous transfer policy in which students may transfer up to 90 credits toward the degree. Admission requires a high school diploma or equivalent. CWU ‘s online BS in information technology and administrative management program has a retail management and technology specialization. Core coursework includes study of the web, networking, information management, and soft skills. The specialization explores the incorporation of technology into management, e-commerce, selling, operations, purchasing, and merchandising. Courses at CWU are delivered using the Canvas learning management system. Student support services include tutoring, career services, and tech support. The retail management bachelor’s degree program is offered completely online. Graduates are prepared for careers in store management, e-commerce, purchasing, entrepreneurship, and distribution and logistics. Admission to the online retail management degree requires an associate degree or a bachelor’s in any field. Retail Strategy: In this course, students learn how fundamental strategies for increasing return on revenues and creating economic value for owners and stakeholders. These skills are necessary for a career as a store buyer. Retail Innovation: This course explores new customer interaction channels and distribution systems, with an emphasis on improving a business's competitive edge while meeting their client's needs. Students also study ways that market changes drive both opportunities and threats in retail. This class is ideal for those who plan to become apparel product developers. Principles and Theory of Management: Students who complete this course leave with an understanding of theories and concepts in planning, organizing, staffing, and controlling. They will also learn how both classical and contemporary management theories operate in today's businesses. When searching through retail management bachelor's degree programs, be sure to choose a program at an accredited institution. The U.S. Department of Education (ED) and the Council for Higher Education Accreditation (CHEA) are responsible for overseeing the nation's accrediting agencies. These agencies evaluate and determine that accrediting bodies are following certain standards. The ED and CHEA oversee six regional accreditation bodies that serve all parts of the nation. There are three different types of academic accreditation: regional, national, and programmatic. Regional accreditation is usually obtained by nonprofit public and state schools, while national accreditation is generally earned by for-profit colleges and vocational or trade schools. Regional accreditation is regarded as more prestigious than national accreditation. Finally, programmatic accreditation is offered by private organizations in a specific discipline and denotes that a program prepares graduates with up-to-date methods. For example, retail management programs may reside in a university's school of business or management that is accredited by the Accreditation Council for Business Schools and Programs. Both the ED and CHEA monitor institutions to assess the quality of their offerings. The ED reviews accrediting agencies and ensures they enforce accreditation standards. The CHEA is comprised of 3,000 degree-granting colleges and universities as well as recognizes 60 institutional and programmatic accrediting organizations. Both the ED and CHEA maintain full lists of accredited institutions on their respective websites. Graduates with an online retail management degree are prepared to become recognized leaders who possess creativity and top decision-making and critical thinking skills. They can pursue careers in a variety of positions in the field, including store management and product development. Below are some of the most common career opportunities for graduates with a bachelor's in retail management. A buyer evaluates merchandise for price, quality, and market demand to help their business determine what they should purchase. In addition, a buyer negotiates contracts, interviews vendors, and visits their production facilities to learn about the manufacturing process. A store manager is responsible for planning, directing, and coordinating all store operations. These professionals help to set and enforce customer and employee policies, oversee daily activities, and manage human resources activities. An account executive creates interest in brands and products through promotions and advertising. They also help negotiate advertising contracts and initiates market research to better understand consumers. A merchandise displayer plans and erects commercial displays in retail settings such as store windows and interiors as well as exhibitions at trade shows. A sales manager directs sales teams, sets sales goals, analyzes data, and develops training programs for sales representatives to help support their success. They also assign sales territories for their teams. Your salary will depend on your occupation, your years of experience in the field, and the specific company you work for and city you reside in. The table below showcases PayScale data for five career paths that graduates with an online bachelor's in retail management can pursue. Nearly every students must obtain some amount of financial aid to be able to finance their online retail management degree. The first step is to fill out the Free Application for Federal Student Aid (FAFSA). Doing so will qualify students to obtain federal grants, loans, and work-study funds to help pay for college. You should also check with your school's financial aid department to learn about scholarships and fellowships. You might also qualify for reduced tuition if you are a veteran of the armed services or an active duty member of the military.